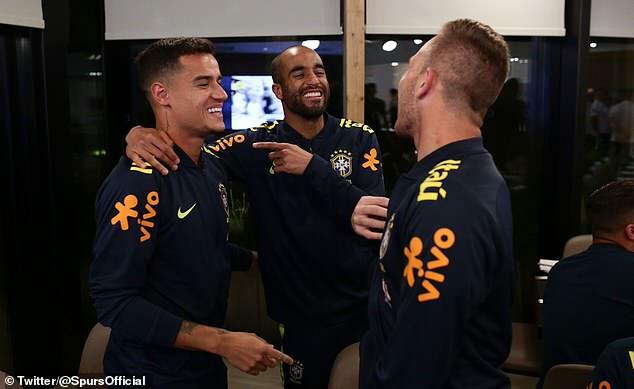 Lucas Moura welcomed the Brazil national team to the Tottenham Hotspur training ground as they use the base to prepare for their upcoming international friendlies. It is the first time Moura has been called up to the Brazil squad in two years after he was brought into the fold following an injury to Gremio striker, Everton. He trained with Brazil team-mates, Philippe Coutinho, Roberto Firmino and Co, as head coach Tite put his side through their paces at the North London camp. The last time Moura was selected was for the 2016 Copa America tournament, which Brazil were eliminated from at the group stage. The 26-year-old greeted his compatriots as they arrived at the Enfield base, where the Moura now plays his club football following the switch from Paris Saint-Germain earlier this year. The forward has been a key part of Tottenham’s side this season and has scored three times in 11 matches so far – including two at Old Trafford. He has established himself as a regular in Mauricio Pochettino’s starting 11, helped in part by Son Heung-min’s absence while he led South Korea to glory at the Asian Games during the start of the season. Gremio forward was ruled out with a thigh injury, sustained during a domestic match, and joins Real Madrid full-back Marcelo in being unavailable for the upcoming games. Brazil face Saudi Arabia on Friday night in their first match, before a tougher test against South American rivals Argentina the following Tuesday. Moura was called up as a late replacement to the squad and will hope to make the most of the opportunity to impress head coach Tite.